Paul and Toni's firstborn enjoys a space bathed in natural light and filled with comfy pieces of furniture. Although Daddy Paul's feed is dominated by black-and-white photographs, it's still easy to spot a few noteworthy details in Seve's room. The sturdy ladder shelf by the window makes it easier to store toys and other belongings, while the vertical stripes on the wall help create an illusion of a higher ceiling and a bigger space. Simple, functional, and spacious, dear darling Lucia's room is completed with furniture pieces in white—including her crib and cabinets. Hints of pink and pastel complete the look, with the playmat matching the colors of the smaller cabinet. Aside from giving Lucia a cozy spot where she can crawl and play, it's an ideal bonding station for her parents, too. Find similar cabinets at Mandaue Foam Furniture Store and SM Home. Lucia also has a playroom where she can entertain fellow tots for fun playdates. A colorful playmat complements the blue accent wall while a floor mattress serves as a comfy addition. Meanwhile, cute wall decals liven up the white wall and keep it from being boring. Tip: Working with wall decals is an easy way to spruce up a dull wall. The best thing about wall decals is you can easily change them depending on the look you want to achieve. For lovely designs you can add to your space, follow Sticker Zone on Instagram. Are you following this pretty young lady's account on IG, too? If you need a dose of happy thoughts, check out Scarlet Snow's costumes (you need to see the Beauty and the Beast shoot she did!) and her activities as well. In a special video, we got to take a peek inside her room that would remind you of a princess's wonderland. To keep it safe for playing, a colorful rubber playmat covers the floor. A corner features a teepee in pastel shades as well as unicorn and animal plushies. Can you spot the nifty storage trick above? Maximize shelves by grouping similar items together and lining them up neatly. If you are fixing your child's room, put together books on one shelf and the stuffed toys together for a clean look. Who wouldn't love spending time in this airy and spacious bedroom? 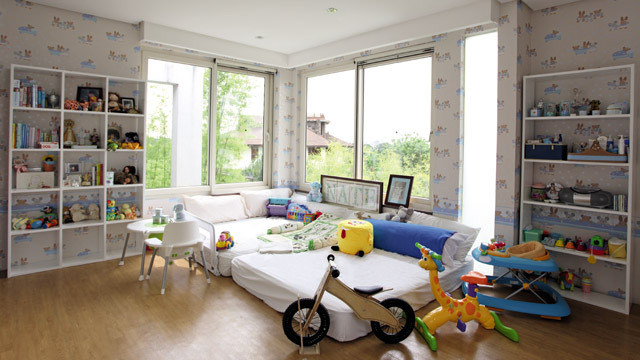 Ogie and Regine's son can appreciate the breathtaking view outside while playing, enjoy an afternoon siesta, and more. The wooden flooring adds a warm and cozy touch to the space while the shelves without backing add to the open feel. If you're designing the room of your little one, you may want to forego the bed frame until he or she is older to avoid accidents. Nate enjoys the comfort of two thick mattresses dressed in white sheets and an assortment of fluffy pillows, too. There are so many things to love about the multi-storey home of Team Kramer (they have a home theater!) but the rooms of the kids are worth taking note. Kendra and Scarlet's room is filled with color—from the rubber mat and sofa, to the sheets and shelves. If you love experimenting with shades and hues, this space can be your peg. Choose complementary colors to keep the look cohesive. We also love the shelves that liven up the wall—the pieces can work as decor while keeping books and essentials in place. 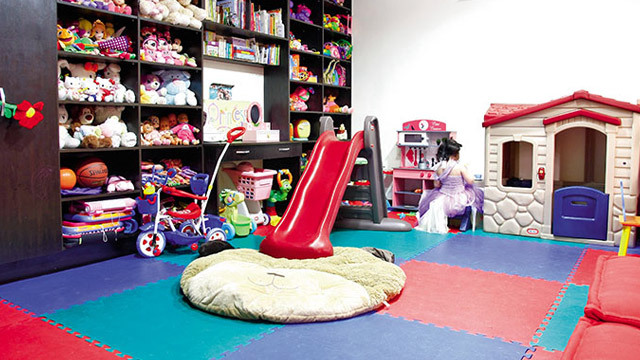 The playroom of the Kramer kids is a kiddie dream come true! It has a mini house, a plastic slide, and a huge shelf of toys, stuffed animals, and books. If you have enough space, you may also want to invest in a sturdy shelf to keep clutter at bay. A common element seen in the rooms of the kids is a captivating wall accent that ties the look of the room together. In the personal space of Ryan and Judy Ann's little princess, the horizontal stripes add an interesting touch while making the space look bigger. To further enhance the wall and give the room a whimsical appeal, decals from Sticker Zone were also added. A corner of Luna's bedroom highlights an inviting wing chair paired with a storage ottoman. Keeping within a neutral palette also adds a sophisticated touch to the space. DIY details make any space at home extra special. 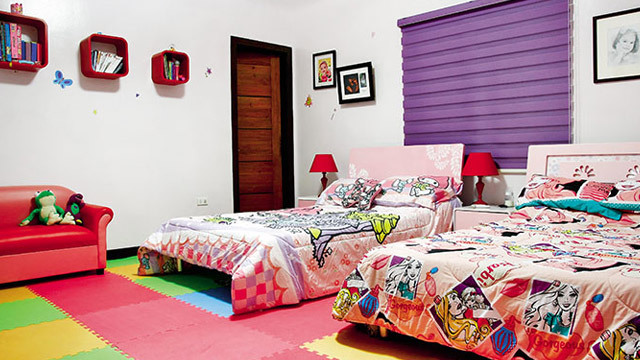 For Zia's bedroom, Daddy Dingdong personally installed the pretty wall details. Dominated by soft colors like pink, lavender, and pastels, the room also has furniture pieces in white and storage must-haves in lively hues. Choosing a light color for the walls made it easier for the owners to mix-and-match the chosen accessories while avoiding an overdecorated look.